You know, graphics is amazing, graphics are interesting, challenging, funny and rewarding. I love reading siggraph papers as much as any other out there, but there’s a thing that I love the most: designing and coding those little helper systems that make your life easier. 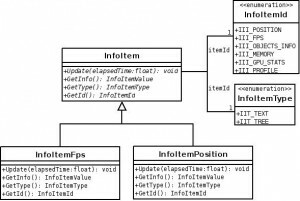 Today, for first time in my blog, I will start sharing pieces of code of that pet engine I’m coding at home :) And today’s piece is the tiny Information Item System. You know, many times you need to get runtime information from the application, information like observer position, memory consumption, frames per second or even runtime profiling information. In previous implementations I had hardcoded that information, that was clumpsy and not very scalable to be honest, so now I had the opportunity to start it all again I decided to do it better, scalable, datadriven and with all those fancy properties that are so cool today. In fact, to be honest, the TextTree was added lately in the design phase, when I realized that profiling could be added to this information system. But having that in mind the design was as simple as it can be. Each item would be capable of gathering all the information needed, process it and format it. Well, I know, it’s stupidily simple! And of course, at this momment I only need 2 InfoItems (and those are the ones that are implemented). All this items are stored into a singleton named, let’s be original, InfoItemManager. This is the only place where this info items should be stored. Now, how all this thing work? Ok ok, you will say, the info items have the info, but that doesn’t mean I can use it. Indeed, the information is there, you only need a way to access to it, right? 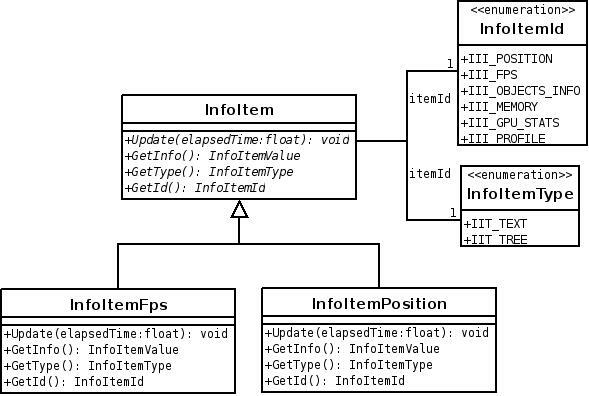 Each one of the InfoItems have 3 key methods: GetId(), GetType() and GetInfo(). That would return you an InfoItemValue union, that, knowing that III_POSITION returns an string well, you can use it directly to write it down wherever you want. Allowing not returning only strings, but actual data, like vec4. Ensuring that there’s only one instance for each infoitem. That is, in fact pretty easy. Lately, in some of my class hierarchies I’m starting to add an static method named Create in the top most base class. This method takes the type of the object to create and returns an instance of the corresponding class. 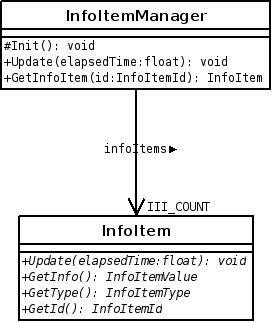 Well specifiying a Create method in InfoItem we could check if InfoItemManager already has an instance of that method (and it should, Init() method in manager ensures that). If the instance exists we only have to return that instance, otherwise we can create an instance, register it in the Manager and return it. Well, that’s all, a pretty easy, simple, little example of code. The next one, I’m still thinking if it will be the Graphic Driver or the widgets system.